Dead simple, and has good reviews from customers around the internet. If you need advanced features this is not for you, but for backing up photos and music, we highly recommend it. Try it now. Online cloud backup services are a dime a dozen these days, and in the midst of all these competitions, standing out isn’t really easy. 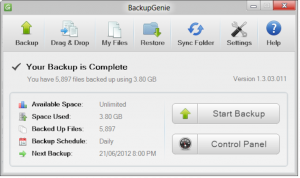 BackupGenie actually plays a different game by providing really simple and easy to use software, and bright graphics adorning its website. You can actually see “simple” and “easy” words for several times on its home page and other pages. Do they really offer such simplicity? Seems so. The signup process is dead simple. They only ask for your name, email and password. Then the software itself is really simple and straightforward to use. 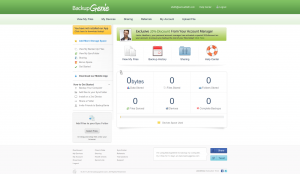 Currently, BackupGenie offers 3 Personal plans and 4 Business plans. How do they fare against each other and other offerings in the industry? Let’s find out. 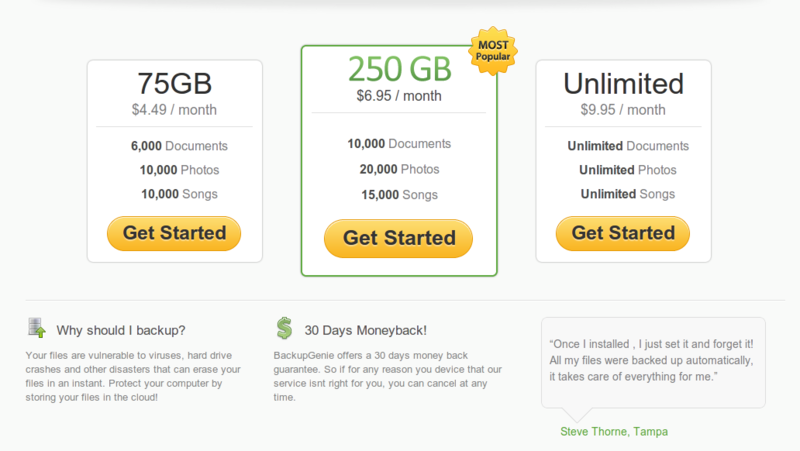 BackupGenie has three plans for personal users, and the plans are pretty straightforward. You can just take a look at the pricing page and then sign up anyone you like. There is also a 30-day moneyback guarantee, but we don’t see any free-trial offered. As you can see, the plans are pretty simple. Business plans get a bit more interesting. Feature-wise, not so much difference except storage and users limit. They currently have 4 business plans but seems like you cannot sign-up yet. 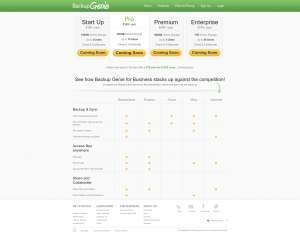 No words from BackupGenie about ETA of their business plans launch date either. It is interesting to see that Premium account offers 500GB but only for 3 users. Perhaps they want to push Pro plan more than Premium. Nevertheless, it seems like pretty good plans for small businesses. We are a bit disappointed that they don’t have a free trial. However, 30 days moneyback guarantee seems not a bad deal and we can still get back our cash if we decided not to use it anymore. Once you signup, it will ask you to choose payment terms. Available ones are monthly, 6 months, 1 year and 2 years. 6 months plan offers 10% discount, 1 year plan gives you 25% discount, and 2 years plan will save you 35%. You can make payment by both Paypal or your credit card. 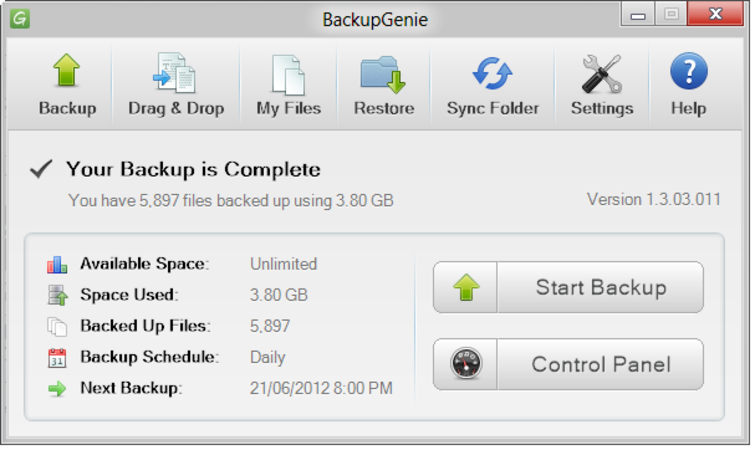 BackupGenie has all the standard features you would expect from a cloud backup service, if you are not a power user. If you are an experienced cloud backup expert and have more advanced backup requirements, then you might feel disappointed with what BackupGenie has to offer. It has all the basic features, but lack fine-tuning and advanced controls. We believe this is intentional because it is simply intended to be simple (no pun intended). We reckon their target market to be somewhat like computer illiterates or people who just don’t want to bother with advanced settings but still want all their important data on the cloud for safety reasons. Let’s take a look at their features. If you are looking for a “wow” factor, then you will have to look elsewhere. 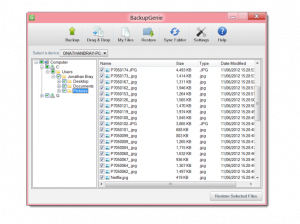 BackupGenie isn’t going to wow you with its features. However, if you are like us who sometimes wish a service to just work without too much hassles, then you will fall in love with BackupGenie. Even for Business accounts, the only additional feature is ability to back up for additional users. There is no news for Linux users yet, so we aren’t sure if it will work. However, BackupGenie software works pretty fine with WINE on Linux. It won’t backup any files though. It seems that Amazon S3 servers are their choice for storage, and they have servers in grid architecture in multiple locations in Virginia, USA. 256-bit AES encryption is used for data encryption and as it is financial industry standard encryption, we figure it is pretty safe affair to store our data on BackupGenie. However, you will have to give a strong password to your BackupGenie account though. Security stars with users. If you just give a password like “123456”, then you are going to be doomed. It is a mystery for us to see that BackupGenie, like ZipCloud and JustCloud, won’t offer live chat or telephone support. Perhaps it is due to their simple offerings and effort to keep costs low, or it maybe due to the fact that most customers don’t need more than what BackupGenie already provides on their website. You can find a lot of video tutorials, a decent knowledgebase and a user forum where you can ask your questions. If you still have questions unanswered by any of those venues, then you can send them an email or submit a support ticket. The claim is 24/7 customer support, however we haven’t tested how true it is though. You just have to choose a plan and sign up using nothing more than your email, name and password. Yes, it is that simple. Then it will bring you to payment page. After you make payments, you will be brought to the Dashboard and BackupGenie will immediately prompt you to download their software. The size is only about 20MB so it is pretty small. Kudos for not having a huge size of software! Dashboard is pretty simple affair. You can control most aspects of your account, as well as view your backed up files . You can upgrade your account to higher paying plan if necessary, but we don’t see any option to downgrade. You can also monitor your account usage here. Overall, we would say that the Dashboard also lives up to what BackupGenie promises: simplicity and ease of use. When you launch the software, it will ask for your username and password. Then the rest is super simple and easy. You can change some settings like schedule, filtering file types and sizes, and so on. But you can only do one backup routine so you can’t schedule your photos to be backed up every hour and the rest once a day. It is a bit limiting, in our honest opinion. But it will work for those who just want a simple backup solution safer than an external hard drive. You can even drag and drop files into the software to backup, in case you want to upload specific files. If you want to browse your backed up files, you can just use the software to browse them. It looks like Windows Explorer and you will be in a familiar environment. Alternatively, you can use their Dashboard online in a web browser for that purpose. There is a sync folder which acts just like Dropbox folder. You just have to copy files you want to sync across other devices into that folder and be done with it. Syncing space is 1GB free for all paid accounts, and you can upgrade up to 20GB for an additional cost (which is not revealed on their site). Yet another dead simple backup service. However, reviews around the Web and customers’ comments seem like they are pretty happy with the service. 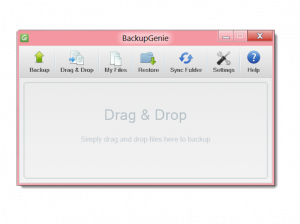 If you are looking for something simple, hassles-free and won’t give you any headache, then BackupGenie is made just for you. However, if you are looking for something more sophisticated with better versioning, scheduling options, and other details, then you will be better off with other software like Mozy or Carbonite. I was a bit frustrated about not being able to phone them, but I got the software working eventually. I signed up for the price which is good.